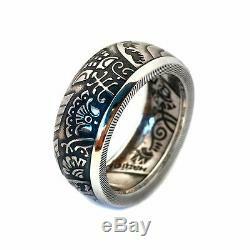 Silver Ukrainian Coin Ring 2017. Ring made from Silver commemorative coin "The Year of the Rooster" 2017 year. This coin commemorates the year of the rooster according to a calendar of Chinese origin. 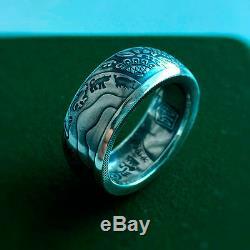 It's a one of the best Silver coin rings made ever! Well suitable for men and women. 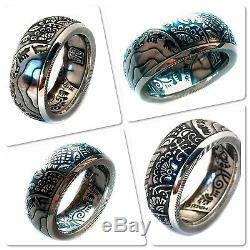 Excellent as wedding ring or as a gift! More info about coin you can see on the official site of the National Bank of Ukraine. 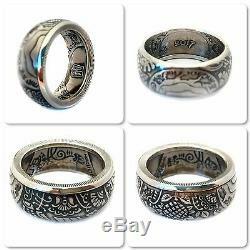 These rings are available in sizes from 7 to 15 (US sizes). The type of finish can be either antique patina or brilliant. Of course this is for your taste and your choice, but I definitely recommend the antique patina finish (as in the photo). With large sizes ring will be more flat and thinner, with small sizes - more rounded and thicker. In the pictures shown a ring in size 10 (US). This is just for example. 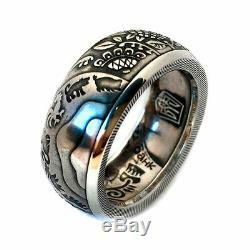 This means that with each new order I will make new ring and since this is handmade, there may be minor differences in the color or shade of the patina. During checkout please message me the size you need and the finish that you would like. If there is no message about the size and finish, then by default ring will be made in size 10 with a patina finish. Weight: 13.7g (0.48oz). 10 mm (may vary slightly depending on size). You will receive everything that you see in the photo: a ring, a gift box, the central part of a coin, a small stone (cubic zircon that was a rooster eye), a case from a coin, a certificate from a coin issued by the national bank of Ukraine with a unique coin number. BTW, I live in Ukraine and I proud that in my country so beautiful coins! 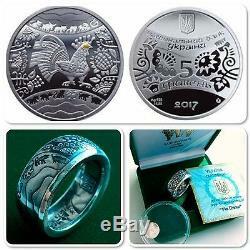 The item "Ukrainian Silver Coin Ring 2017 Ukraine Silver 925 5 Hryvnia Made in Ukraine" is in sale since Thursday, August 24, 2017. 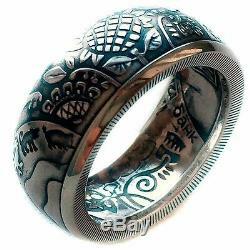 This item is in the category "Jewelry & Watches\Handcrafted, Artisan Jewelry\Rings". The seller is "slava7828" and is located in Chernigov. This item can be shipped worldwide.